The Sustainable Fibre Alliance (SFA) was registered as a charity in England in 2016. The SFA brings together supply chain actors to promote sustainability in the cashmere fibre producing industry. The SFA promotes the adoption of good practice as set out in the SFA Sustainability Standard Codes of Practice. The SFA is a standards and accreditation body working globally to build the capacity of herder families to manage grasslands and their animals more responsibly, while providing credible data on results and impact. The SFA is also a membership organisation aiming to provide value for all members through targeted service delivery, especially in the cashmere supply chain. Why does the SFA exist? The SFA was founded in 2015 as a joint response to the environmental and social impacts of cashmere production. Supporting herders is at the heart of our work and is the reason for SFA’s existence. Cashmere is a beautiful luxury renewable fibre, but its production need to be more sustainable. As stewards of the SFA Cashmere Standard System, our focus is on providing training and learning opportunities for herders to adopt more environmentally, socially and economically sustainable production practices. SFA is an independent, non-profit organisation that protects grasslands for future generations. Space for pre-competitive collaboration – provides safe space for industry and other stakeholders to discuss shared sustainability challenges, best practices, and learning. Field level credibility – Codes of Practice recognised by other organisations as being relevant, applicable and credible. Similar stakeholder engagement will be required for credibility in other geographies. 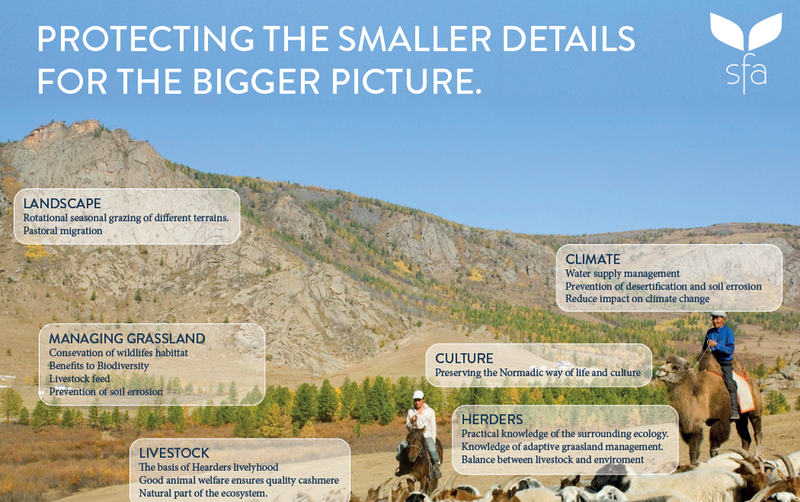 Holistic Standard with global application – Codes of Practice cover environmental, social and economic aspects of sustainability for herders. Codes can be applied to herders in any geography, with some local adaptation. What is SFA Standard System? The SFA is an accredited member of UN Convention on Combatting Desertification (UNCCD) and supports Land Degradation Neutrality 2030 targets.